Wanna have the coolest outfit and win all the Halloween costume contests? Look no further, here’s what you need to make your own EL Wire glow in the dark stickman costume! Here at LED Montreal, we’ve created a special kit which includes every electronic part you need to make it happen. All you have left to choose is the color! It’s simple and fun! Here’s what we think is the best way to make your own El Wire glow in the dark stickman costume. Please note that there are other ways to make it so if you’d rather go a different path, you can still find what you need in terms of EL Wire and EL Wire Accessories by clicking on the links. 1. Get all the supplies and tools you need. 2. Place EL wire on the clothes. Lay out the clothes on a flat surface and place the EL wire on top of it according to the plan. Make sure that the on/off switch is accessible. 3. Temporarily fix the EL wire onto the clothes using tape. 4. If needed, cut the extra bits of EL wire to make it fit. When you cut the end of the EL wire, transfer the end cap. We do not recommend reattaching the extra pieces as it is a complex and fragile procedure. If you insist on doing so and are comfortable with soldering, you can find online videos on how to cut and reattach EL wire. 5. If you need to create spaces with no light, use black tape to cover parts of the EL wire. 6. 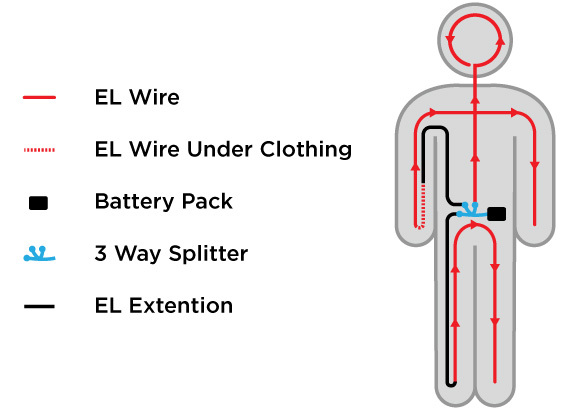 Semi-permanently fix the EL wire to the clothes. Use fishing line to stitch the EL wire to the clothes. Tie knots at various places on the EL wire with the fishing line for a strong hold and subtle look. Cut off the extra pieces of fishing line. 7. Double check your connections and make sure everything stays in place. 8. Remove the tape that was used for the temporary fix. 9. Try on the costume and have fun! What kind of batteries does it need and how many? How do you make the masks in the picture? Making EL wire masks does require time , skills and specialized equipment. I encourage you to search for EL wire masks tutorial on website like YouTube. When Purchasing the EL Wire StickMan Combo is it possible mix and match colours? Sure, when checking out, before making your payment, you can leve a note for your order. Just let us know which colors(3) you want.